Do you let your kids eat chips before dinner? These chips, at least! They are so easy to make and we all love to snack on them. It’s an all natural food prepared with all natural ingredients so it’s a healthy snack in every way. Sweet potatoes are another of nature’s super foods – packed with nutrients and vitamins! The really cool thing about these potato chips is that you can season them however you’d like. Add a little chili powder for some spice or garlic salt for garlicky goodness. You can’t go wrong experimenting with different flavor combinations! Slice potatoes very thinly (I used my spiral vegetable cutter). Spray pan with olive oil. Bake in oven that has been preheated to 350 degrees for about 20-25 minutes (or until desired crispiness). You can either season the potatoes before or after they are cooked. My daughter actually preferred them without any seasoning at all. ENJOY! 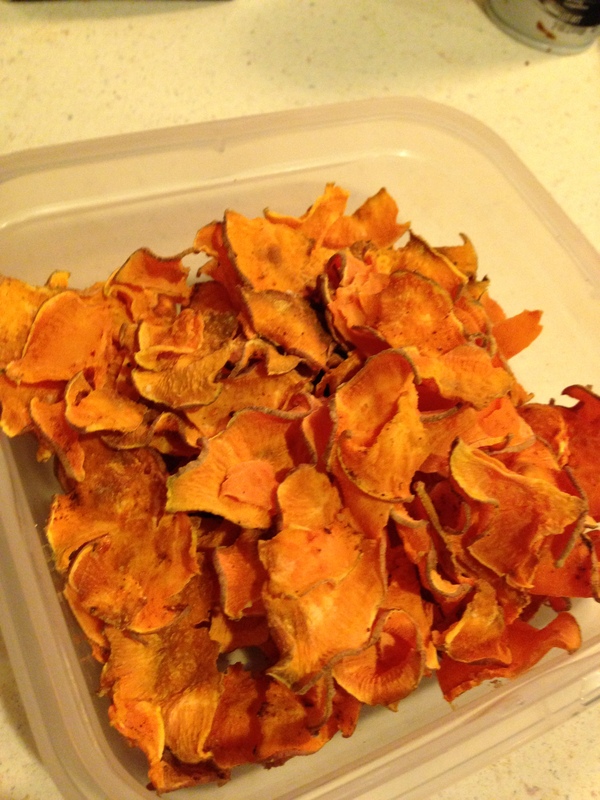 Have you ever tried making sweet potato chips as a healthy alternative to a salty snack? I’ve not heard of a spiral vegetable cutter before. What brand is yours? April, have you tried cutting sweet potatoes with a mandolin? How does it compare to your spiral cutter? These chips look fantastic! It’s not as fun as the spiral slicer but still works really well!